This study reports the spatio-temporal changes in water quality of Nullah Aik, tributary of the Chenab River, Pakistan. Stream water samples were collected at seven sampling sites on seasonal basis from September 2004 to April 2006 and were analyzed for 24 water quality parameters. Most significant parameters which contributed in spatio-temporal variations were assessed by statistical techniques such as Hierarchical Agglomerative Cluster Analysis (HACA), Factor Analysis/Principal Components Analysis (FA/PCA), and Discriminant Function Analysis (DFA). HACA identified three different classes of sites: Relatively Unimpaired, Impaired and Less Impaired Regions on the basis of similarity among different physicochemical characteristics and pollutant level between the sampling sites. DFA produced the best results for identification of main variables for temporal and spatial analysis and separated eight parameters (DO, hardness, sulphides, K, Fe, Pb, Cr and Zn) that accounted 89.7% of total variations of spatial analysis. Temporal analysis using DFA separated six parameters (E.C., TDS, salinity, hardness, chlorides and Pb) that showed more than 84.6% of total temporal variation. FA/PCA identified six significant factors (sources) which were responsible for major variations in water quality dataset of Nullah Aik. The results signify that parameters identified by statistical analyses were responsible for water quality change and suggest the possibility of industrial, municipal and agricultural runoff, parent rock material contamination. The results suggest dire need for proper management measures to restore the water quality of this tributary for a healthy and promising aquatic ecosystem and also highlights its importance for objective ecological policy and decision making process. The authors would like to thank the Higher Education Commission (HEC), Pakistan for financial support and Cleaner Production Center, Sialkot, Pakistan for their valuable cooperation in preliminary water samples analyses during this study. The first author also recognizes the kind support rendered by Professor Dr Tahira Ahmed during field sampling design. Thanks are due to Zafeer Saqib, Abdul Rehman, Arshed Makhdoom Sabir and Rizwan Ullah for their assistance in the field work. Ghani, J. (2002). Sialkot – A city at work. Retrieved from http://www.the-south-asian.com/March2002/Sialkot%201.htm March. Nation Daily (2002). Leather industries fetching over $600M annually. Retrived from http://nation.com.pk/daily/nov-2004/4/bnews2.php. Nov. 4. Sanchez, E., Colmenarejo, M. F., Vicente, J., Rubio, A., Garcýa, M. G., & Travieso, L. (2006). Use of the water quality index and dissolved oxygen deficit as simple indicators of watersheds pollution. Ecological Indicators. doi: 10.1016/j.ecolind.2006.02.005. Sánchez-Carrillo, S., Alatorre, L. C., Sánchez-Andrés, R., & Garatuza-Payán, J. (2007). Eutrophication and sedimentation patterns in complete exploitation of water resources scenarios: An example from northwestern semi-arid. 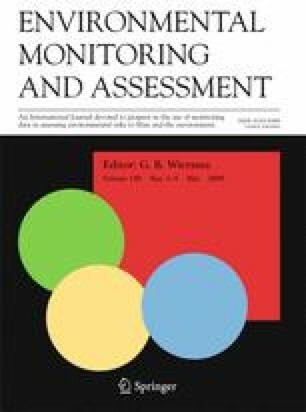 Environmental Monitoring and Assessment doi: 10.2007/s10661-006-9541-x.